Most young people, when they dream of working for an airline, imagine themselves airborne. 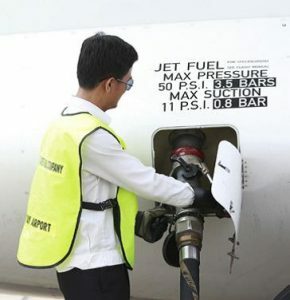 Whether as a pilot or among the cabin crew, airline work usually involves flying, right? 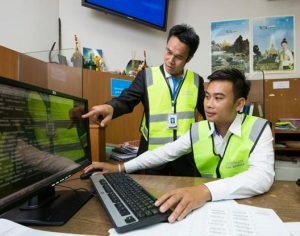 Not for Sisavath Southammavong (centre), who spends his days in an office poring over complicated mathematical formulas, all related to the weigh and balances of everything that goes into an aeroplane before takeoff. 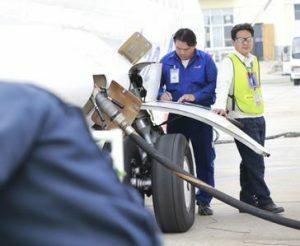 From fuel to food, baggage to passengers, staff to cargo, Sisavath and his team are across it, in numerical terms, making precise calculations to ensure the safety of everyone involved. Sisavath loves his work, but it wasn’t always a dream job for him. When he finished college and graduated at the age of 23, he, like everyone else, had plans to be a pilot. 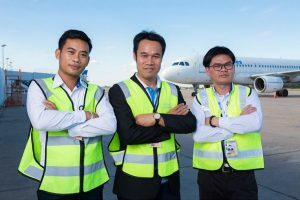 But health problems forced him to choose a different tack, and he eventually trained to join Lao Airlines’ Weight Balance Division. That was 14 years ago, and he hasn’t look back. Now the manager of his division, he oversees a staff of 11 and plans to stay in the job until he retires. But even though he enjoys coming into work every day, the job isn’t always easy. “A lot of people would like to come and work for this division, but they don’t realise that it’s actually quite difficult work,” he says. “This job is quite strict with calculations, you have to be exact and precise and sure, and if you’re not that kind of person and don’t like learning formulas, it’s not for you,” he says. And the training required to do the work is equally rigorous, with four mandatory technical courses, and re-training every two years. But while the training is world-class and Sisavath has international-grade skills, he has no plans to leave the airline, or his home country. Instead, he encourages as many people as possible to join him in his field of work, from friends and family to neighbours and their families. “One of my nephews has already said he wants to be like me,” says Sisavath, with pride. “But it is important to do it properly and remember safety at all times.